About a year before the incident, Chavelo and five other members of Guadalupe Carney had been accused by Pedro Osorto of stealing one of his trucks full of African palm fruit. The truck didn’t even belong to Osorto nor did the palm. The truck belonged to the campesino collectiveLuchemos Juntos. Another collective, Nueva Generación, had harvested the palm from land usurped by Pedro Osorto. National Police sided with Osorto, presumably after accepting a bribe, and arrested the 6 men, held them overnight, and then released them. They were then obligated to go into the courthouse every Friday, conceivably for the rest of their lives, to sign in a registry. The stated reason was to ensure that they didn’t leave the country while the police investigated the matter, but the real reason was to intimidate and harass them. This is standard practice in the criminalization of the campesinos. Sometimes they are forced to travel many miles to sign a registry. If they don’t, there is a warrant issued for their arrest. Currently there are over 2000 campesinos in Honduras with arrest warrants for not signing a registry. Greg McCain is a volunteer human rights activist living in Honduras. He coordinates with the Chicago based La Voz de los de Abajo and the Honduran Solidarity Network. How does a constitution die? In Honduras, it started with a coup. In June 2009, the military forcibly removed President José Manuel Zelaya Rosales from the country. They later claimed to be acting on a warrant issued by Supreme Court justice Tomás Arita. The army’s actions were given a veneer of legitimacy by the Honduran Congress. It voted for the head of Congress to become the new president, ushering in the de facto regime of Roberto Micheletti. Fast forward to January 2013: the Chief Justice of the Honduran Supreme Court, Jorge Alberto Rivera Avilés, is unable to seat a panel of five justices, from among the 15 justices on the court, to review an appeal of the constitutionality of a law passed by the Congress. The reason? The law under review allowed Congress to remove four justices serving on the Supreme Court itself. The four people appointed to replace them, and a majority of the justices who were not dismissed and still served on the court, recused themselves from hearing the case because virtually everyone either was directly involved or had expressed an opinion in support of the dismissed justices. For anyone trying to understand Honduras by comparing it to the US constitutional model, the situation there must seem virtually unintelligible. The modern Honduran constitution, ratified in 1982, calls for the familiar division of power between three branches of government: the legislative, executive, and judicial. Congress makes laws; the president and executive officers carry out policies authorized under the law; and the Supreme Court serves to assess when laws are passed that infringe on the guarantees of basic rights enshrined in the Constitution. However, Honduran governance lacks some fundamental checks and balances necessary to maintain the balance among these branches. The Supreme Court isappointed by the legislative branch– the same branch that creates the laws whose constitutionality the court is charged with judging. Supreme Court justices are appointed for terms of seven years, from a list proposed by a committee representing a wide range of formally recognized social and religious organizations. In practice, the candidates for Supreme Court appointments are politically indebted to those who nominated them and, especially, to the Congress that appointed them. The congressional role in selecting Supreme Court justices is intended to limit the executive power. In that, it certainly worked: the executive branch of the Honduran government is much weaker than the legislative. Where presidents can serve a single four-year term, congress members can be, and are, re-elected over and over. Congress has the authority to approve the national budget, and so to constrain executive action. And it is congress that appoints the Supreme Court, now beholden to Congressional power. It would take a brave justice to rule that the laws enacted by the patrons who put the justices in office are unconstitutional. The unbalancing of power among the three branches illustrates an essential problem with the Honduran constitution itself, characterized in 2009 by former Costa Rican President Oscar Arias, attempting to negotiate an end to the crisis that followed the coup, as “the worst in the entire world”. It has been amended over and over due to aprocedural peculiarity. With the exception of a few constitutional articles that are “set in stone” (unchangeable), everything else in the Constitution is open to Congressional tinkering. No wide referenda are required to ratify changes Congress proposes to the Constitution: just as long as the same change is passed in two consecutive sessions of congress, it is in. Furthermore, with re-election virtually locked in by a party systemthat controls who gets nominated for office, the members of a new session of congress will almost always agree with their predecessors, because they will mostly be the same people. Among the many changes the Honduran Congress has made to the Constitution was one in particular, inserted in 2002 and reiterated by Congress in 2004, that granted itself the right to interpret the Constitution. That peculiar insertion, needless to say, co-opts the place of the Supreme Court in the division of labor envisaged in the three branch model of government. The Honduran Supreme Court declared the proposed change unconstitutional in 2003, a violation of constitutional prohibitions against changing the form of government. In a fit of pique, Congress has refused to allow that decision to be formally published. If the court’s decision were a piece of congressional legislation, lack of publication would mean it was not in force. Supreme Court decisions, however, don’t need to be published to be effective. Still, absent someone bringing a case to the court based on the changed language, it remains in the Honduran constitution, letting the Congress act as if it has some of the powers originally granted to the Supreme Court in the Constitution. What does this lead to? Among other things, to a court that is beholden to Congress for its very existence producing a post-facto rationalization of the forcible removal of a president from office, as well as a ratification of the usurpation of power by a member of that same Congress. That kind of acquiescence sets up an expectation on the part of the Congress: the Court exists as a partner, not as a separate office balancing the exercise of power. Which brings us to the crisis unfolding today. When the Honduran President and Congress, under pressure from the US to clean up a corrupt and violent police force following a string of well-publicized murders, passed a law in 2012 to purge the police, they got it wrong: they suspended basic legal guarantees of due process for those under suspicion. The “Sala Constitucional“, a subgroup of the Supreme Court, heard an appeal of the law, and ruled that it was unconstitutional for that reason. Under Honduran legal procedure, the decision had to be reviewed by the entire court, because it was not unanimous: four justices saw the law as unconstitutional, while one approved. This was not the only decision taken by the court recently that went against the president and Congress. As in previous instances, Honduran President Porfirio Lobo Sosa spoke angrily against the court, accusing them of failing in a duty to support the rest of the government in its righteous mission. Not coincidentally, on the day the Sala Constitucional issued its opinion, the Lobo Sosa administration had announced it was going to seek congressional extension of the police cleanup for another six months. The court clearly presented the Honduran President and Congress with opposition they found unacceptable. Lobo Sosa stated the position most clearly: the different branches of government, he said, “are independent, but complementary”, and “the first power of the State is the Legislative branch because it is the one elected”. Leave aside whether the Honduran police should be reviewed, and the worst offenders removed. Leave aside whether those under review should have the same rights to due process as any other Honduran citizen is promised in the Constitution. For Lobo Sosa, and for the head of Congress and close political ally Juan Orlando Hernández, the court wasn’t doing its job in a system of checks and balances: it was being insubordinate in an imagined hierarchy. In retaliation for this independence, on December 12, Congress heard a hastily manufactured “report” accusing the court of administrative error. Among other points, the report argued that the opinion of the Sala Constitucional of the Supreme Court “is not in keeping with the security policy implemented by the Executive and Legislative powers”, making it clear that for the congressional authors, the role of the court is to go along, not to act as a balancing branch of government. As they deliberated, the Honduran armed forces and police surrounded the congressional building. At the end of the night, congress members, led by the National party of Lobo Sosa and Juan Orlando Hernández, passed a law giving Congress the power to fire Supreme Court justices. As soon as the congressional measure was passed, the four justices who opposed the police purification law were removed from office, and four replacements were sworn in. Many justices who remained on the court spoke out in favor of their ousted colleagues. An appeal of the statute created to allow the firing was launched– in the Sala Constitucional of the Supreme Court, the body from which the four had been removed. It was thus destined to be heard by the four justices appointed in their place (plus the sole justice who kept his job by agreeing with the president and Congress). The newly appointed justices promptly declined to rule on the legality of the law that led to their own appointment. The head of the Supreme Court, Rivera Avilés, then formally designated four other Supreme Court justices to hear the appeal. They promptly recused themselves as well, because they had already expressed an opinion against the firing, and in favor of justices who had been dismissed. The third time around, Rivera Avilés was forced to reach outside the actual sitting Supreme Court justices, because he had run out of sitting Supreme Court justices. Hischoices for the new panel were the three remaining Supreme Court justices who were available; an appeals court justice; and the legal counsel for the Supreme Court. The Supreme Court counsel had at least been on the long list of candidates for the court proposed by a mandated citizen commission, from which Congress originally appointed the fifteen Supreme Court justices. Their decision is expected within 72 hours (three days). Why did Congress react so strongly to the ruling by the Sala Constitucional on the law to clean up the police? It was not the first post-coup law that the court found was flawed. Earlier in 2012, the Supreme Court also ruled that a proposed law allowing the creation of “model cities”, a pet project of President Lobo, violated sections of the Constitution dealing with territoriality and sovereignty. The rhetoric after that incident was heated, with President Lobo calling the justices who ruled against the law “traitors”. But the justices kept their positions. So what was different in December? First, the national elections had entered the scene, with the selection by parties of their candidate slates for the contest that will take place in November of this year. The primary voting was, by almost all accounts, deeply flawed. In the ruling National Party, candidate Ricardo Alvarez, mayor of Tegucigalpa, was denied his party’s nomination. Instead, it went to the current head of Congress, Juan Orlando Hernández. Alvarez protested the decision to the Supreme Election Tribunal—the government commission overseeing election law—and, when his protest was rejected took it to the Supreme Court. One theory is that the disruption of the court was, at least in part, intended to delay or even permanently defer the review of this matter, which could cast doubt on Juan Orlando Hernández’ candidacy. As a less byzantine motivation, the opinion of the Sala Constitucional was not final because it was not unanimous. The next step mandated under Honduran law was a hearing by the entire Supreme Court. The full court has, understandably, not gotten to this hearing, what with having to try to empanel a Sala Constitucional that can hear an appeal about the makeup of the Sala Constitucional. So effectively, no decision has legally been ratified in the case of the police law. But then again, that is really a moot question. The author of the Congressional “report” argued that the court should never have ruled on the original appeal because the offending statute was no longer in force. The congressional act suspending parts of the police legal code (and thus denying reviewed officers due process) was put in place through an expansive use of the constitutional power to take emergency actions, which must be for strictly limited periods of validity, in this case six months, ending November 25, 2012. Such expansive use of emergency power is another legacy of the coup of 2009: in the wake of the coup, the de facto regime used this power repeatedly to try to limit the exercise of rights of assembly and protest by civilians. While President Lobo had declared his intention to ask that the emergency measure be extended, technically the decree had ended and that apparently should have led the court to set the matter aside. Presumably, the Chief Justice could simply have used that technicality to avoid what he clearly did not and does not want to do: offend his congressional patrons. Since then, Honduran press reports note that the procedures found objectionable have been extended through a new legal decree. Which brings us back to the big question: why the exercise in brinksmanship by the Congress, which has reduced the Supreme Court to being unable to act? The debate in Congress produced some of the most blunt statements about the institutional weakness of separation of powers seen since the 2009 coup. Editorial writers and members of congress alike worried out loud that this crisis will usher in a period of dictatorshipequal to that of Tiburcio Carías Andino, who controlled the country for decades in the first half of the twentieth century. We see two possibilities. First, that an appeal of the outcome of the primary election in the Nationalist Party was so threatening that it had to be stopped. Or second, that Juan Orlando Hernández used Congress as his personal political machine to stabilize his own route to the executive office. But maybe the answer is not so complicated. Ever since the Honduran Congress flexed its muscles in June 2009, removing the president and demonstrating that the Supreme Court was its tool and not an independent branch of government, Honduras has been living with a legislature that appears to recognize no boundaries to its ambitions. The Sala Constitucional contradicted that imperial body. The justices who did not toe the line were disciplined. As a result, who now expects the Supreme Court to ever try that again? Rosemary Joyce is Professor of Anthropology at the University of California, Berkeley. Russell Sheptak is a Research Associate at the University of California, Berkeley, specializing in historical anthropology. Together and separately, they have conducted anthropological and historical research in Honduras for more than thirty years. At the time of the 2009 coup, they were collaborating with the Ministry of Culture of Honduras on cultural heritage programs that were part of the Zelaya administration’s commitment to citizen participation. A victory has been achieved by brave gay democracy leader Erick Vidal Martinez and the courageous LGBT community of Honduras. 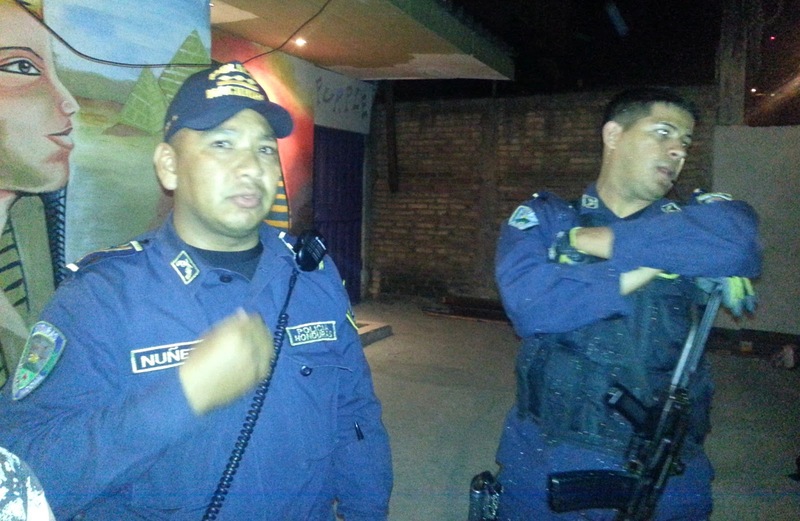 As I reported previously this week, on January 13 the National Police arrived at the Anubis bar in Tegucigalpa around 1:00 AM and conducted a raid. After much pressure from gay and straight human rights defenders inside Honduras, and other parts of the world, Erick and the community received an apology and promises for change were made by government and police officials. Let’s get to the photos and then the report. Please add this line when using the images: “Photo Credit: Erick Vidal Martinez”. Click the pix to enlarge. Two uniformed officers of the National Police stood guard outside the Anubis, shortly after the raid started. The officer on the right is resting his arms on a rifle. Another policeman inside the bar checked the identity cards of the LGBT patrons, wrote the names and additional personal information down on paper, while other officers smashed a few chairs and broke glass furnishings in the bathroom. Questioning the LGBT patrons was conducted by more officers, seen wearing baseball caps on the left, foreground, and on the right, center. Everyone was made to sit or stand in one area. After getting all the names, asking questions, causing damage to the furnishings and walls, and deciding who was to be taken into custody down at the National Police station house, everyone was outside. The cops loaded up the arrestees in the back of a police pick up truck. Three of the arrestees, moments before the truck drove away to the nearby National Police station house for Tegucigalpa. I thank everyone for their solidarity and words of concern about me. 5. Develop an agreement with advocates regulating future actions of the police, such as assigning one officer to be liaison between arrestees and human rights groups. Chief of Police Bonilla expressed apologies on behalf of women and men of the Police, recognizes that it is vital to take actions to restore the image of the institution and treats everyone fairly. Muchas gracias, to all friends of mine and Honduran LGBTI people from other countries. We receive 53 letters of solidarity from foreigners and together we go forward. TEGUCIGALPA, Honduras — Street surveillance cameras in one of the world’s most dangerous cities were turned off last week because Honduras’ government hasn’t paid millions of dollars it owes. The operator that runs them is now threatening to suspend police radio service as well. Teachers have been demonstrating almost every day because they haven’t been paid in six months, while doctors complain about the shortage of essential medicines, gauze, needles and latex gloves. This Central American country has been on the brink of bankruptcy for months, as lawmakers put off passing a budget necessary to pay for basic government services. Honduras is also grappling with $5 billion in foreign debt, a figure equivalent to last year’s entire government budget. The financial problems add to a general sense that Honduras is a country in meltdown, as homicides soar, drug trafficking overruns cities and coasts and the nation’s highest court has been embattled in a constitutional fight with the Congress. Many streets are riddled with potholes, and cities aren’t replacing stolen manhole covers. Soldiers aren’t receiving their regular salaries, while the education secretary says 96 percent of schools close several days every week or month because of teacher strikes. Some government offices must close because they don’t have ink to take fingerprints. The country’s national registration agency has been shuttered for 10 days because of unpaid salaries. The local chapter of the international watchdog group Transparency International issued a study in December that alleged some lawmakers had spent money on plane tickets to a tennis tournament in Spain, Mother’s Day gifts and other personal expenses, the report found. The study’s author, Ludin Ayala, said the country’s Congress is the most expensive in Central America, although Honduras is the poorest country the region. Former presidential candidate and legislator Olban Valladares charged that much of the public money has indeed gone into campaigns ahead of November’s elections, in which the president, mayors and 128 congressional representatives will be elected. “Sadly, we have a great number of candidates who are state officials and their tendency is to abuse state resources that they control to fund their campaigns,” Valladares said. “They are the ones who have left us today with an enormous debt … leaving us a country that’s unsafe, indebted and isolated in the world,” Hernandez said in a news release. Instead, lawmakers are discussing proposals already declared unconstitutional by the Supreme Court and don’t deal with the immediate financial problems. On Tuesday, for example, Congress approved a law that would allow any elected official to be impeached. Hugo Noe Pino, an economist at Honduras’ Central American Institute for Fiscal Studies, noted that Congress approved the sale of an additional $750 million in bonds last November without resolving any of the core budget issues. Financial fraud isn’t limited to the government. Tax evasion, for example, is widespread, with the government missing out on an estimated 43 percent of revenue due, said Mario Lopez Steiner, Honduras’s tax director. “The culture of tax evasion is incredible in Honduras,” he said. Congress, whose majority belongs to Lobo’s party, dismissed several judges without an impeachment trial. Meanwhile, the fired judges continue to enjoy the use of their offices and cars with drivers, even as other government employees go unpaid. Because Congress hasn’t replaced the dismissed judges, no one can rule on their appeal to be reinstated because the court’s other justices have recused themselves from the case. “Public power has been turned upside down in a brazen way,” said Oscar Cruz, a former prosecutor in charge of defending the constitution. The government and the ruling bloc have at least one idea to solve the fiscal crunch: They’ve introduced a bill that would create the country’s first sales tax while eliminating tax breaks for companies that import goods. The bill’s supporters predict it will generate an additional $1.2 billion in revenue, which would double the government’s yearly tax intake. Businesses such as fast food franchises have long been exempt from taxes because they supposedly promote tourism even though many of them “are neither in tourist zones nor do they attract tourism,” said Lopez Steiner. Such tax breaks have been “approved as payments for political favors and as a result of the financing of election campaigns, which are always linked to tax favors,” he said. Some families have survived the government vacuum with remittances sent by some of the 1 million Hondurans living in the United States. Their money equals 19 percent of the country’s gross domestic product, according to the World Bank. Yet it isn’t enough for government workers such as teacher Daniel Espunda, who have lost paychecks to the political crisis. As predicted after the June 28, 2009 coup in Honduras, the military-backed regime now in power is passing a new, corporate-friendly mining law that will usher in a new wave of mining exploration and extraction in what has become the ‘murder capital of the world’ and is the most repressive country in the Americas. This is in part what the 2009 military coup was for. If and when global companies again start mining operations, this will result in repression and other human rights violations, and in health and environmental harms. Violations and harms are predictable and inevitable in this undemocratic, repressive country wherein the rule of law is manipulated and corrupted in favour of the powerful economic sectors. There is no way to engage in large-scale business activities in the Honduras of today without contributing to and benefiting from harms and violations, corruption and impunity. In 2008, the government of President Zelaya placed a moratorium on granting new mining licenses, acknowledging that the previous mining law was inadequate. This followed upon a 2006 Supreme Court finding that over a dozen articles of the previous mining law were unconstitutional. The moratorium grand-fathered in Goldcorp Inc. that, since 2000, had been operating its “San Martin” mine, infamous for water contamination and depletion and for causing devastating health harms in local communities. By May 2009, the government of Honduras had prepared a new draft mining law that was to increase mining related taxes, prohibit mountain-top removal / open-pit mining (such as Goldcorp’s “San Martin” mine), prohibit the use of chemicals such as cyanide and mercury, and – very importantly – require a formal, transparent community consultation process before the approval of mining concessions. The June 28, 2009 military coup, planned and carried out by Honduras’ oligarchy and military elites, brought an end to this process. The post-coup regime was soon ‘legitimized’ and then supported by the U.S. and Canadian governments. All along, the global (mainly Canadian) mining industry was waiting for a new, mining-friendly law that would lift the suspension on some 400 mining concessions already granted. Since the coup, Honduras has become the ‘murder capital of the world’ and is the most repressive country in the Americas. Hundreds of civilians, involved in the pro-democracy movement, have been murdered (some with signs of brutal torture). Repression has reached levels comparable to the worst years of U.S.-backed military repression in the 1980s. In late 2012, the violence, repression, impunity and corruption continued unabated. The fears of Hondurans are not theoretical. From 2000-2008, Goldcorp Inc. operated a mountain-top removal / open-pit cyanide leaching mine in the Siria Valley. Widely documented are: forced relocations of homes and villages; contaminated water sources; dried up water sources; cracked houses due to explosives; repression against community leaders; etc. Goldcorp’s San Martin mine is most infamous for devastating and deadly health harms that continue today, 5 years after closure. The Coalition of National Environmental Networks is demanding the suspension of all proceedings related to a new mining law, given that there has been no public process related to the contents of the law, and that the law does not provide for binding and enforceable protections against and accountability for environmental and health harms, human rights violations, and for full respect for community rights to free and prior informed consent. The Coalition calls on the Honduran people to use any political and legal tools available to defend their lives, communities and territories, and to insist on full public participation in the drafting and passing of a proper mining law. A majority of mining companies waiting to begin exploration and mining are Canadian; a majority of investors in the Canadian mining industry are private and public American funds. The U.S. and Canadian governments have, since June 2009, blood on their hands given their role legitimizing and doing business with the repressive regime. Recently, the Canadian government has actively supported the re-writing of this new corporate friendly mining law. (Mining Watch report “Canada’s Development Aid Dollars At Odds With Communities”:https://www.miningwatch.ca/article/canada-s-development-aid-dollars-odds-communities). North Americans – tax-payers, voters and investors in private funds and pension funds – must say no, we will not allow our governments to openly support and our companies and investors to do ‘business as usual’ with a repressive military-backed regime that came to power through a coup and then fraudulent repressive elections. TEGUCIGALPA, Honduras — El Congreso de Honduras aprobó la noche del miércoles un polémico proyecto de Zonas Especiales de Desarrollo, más conocido como “ciudades modelo”, que ya había sido declarado inconstitucional y fue uno de los motivos por los que el Poder Legislativo destituyó a varios magistrados de la Corte Suprema de Justicia dando lugar a la crisis política más intensa que ha vivido el país desde el golpe de Estado de 2009. El proyecto presentado por Rodolfo Irías, diputado del Partido Nacional, “recoge las modificaciones necesarias para incorporar los supuestos expresados por la sentencia constitucional e implica la modificación de varios artículos de la Constitución de Honduras en lo que se refiere a la organización territorial del Estado y el poder judicial”, según el legislador, pero también continúa refiriéndose a “zonas sujetas a un régimen jurídico especial, con autonomía administrativa y sometida a referéndum o plebiscito con ciertas excepcionalidades”. La propuesta se aprobó con 110 votos a favor, 13 en contra y cinco abstenciones. Las llamadas Regiones Especiales de Desarrollo (RED) fueron definidas como “una maquila de última generación” por uno de sus principales impulsores, el presidente del Congreso y candidato presidencial Juan Orlando Hernández, o una “zona libre 2.0” por Michael Strong, responsable de MGK, el grupo de inversores estadounidenses que pretendía comenzar a desarrollarlas en 2012 antes de que el proyecto se paralizase por su inconstitucionalidad. Entre los argumentos expuestos en la sentencia, los magistrados constitucionales sostuvieron que “las inversiones extranjeras que se espera captar implican para el Estado de Honduras enajenar el territorio nacional lo que expresamente prohíbe nuestra Constitución” ya que su construcción significaría que “se habrá privatizado el Estado de Honduras y por tanto habrá desaparecido como tal para dar paso a una gran corporación mercantil”. Juan Orlando Hernández, presidente del Congreso Nacional, declaró al inicio del segundo y exitoso intento de aprobación de la ley que para el diseño de estas zonas “seguimos grandes ejemplos que existen en el mundo sobre cómo potenciar ciertas zonas, sea para centros financieros, distritos agroindustriales, distritos de generación eléctrica, zonas adyacentes a puertos y aeropuertos, la zona sur del país, donde Corea del Sur tiene mucho interés en diseñar un régimen o un distrito que nos potenciaría en la región”. German Leitzelar, diputado por Tegucigalpa, opinó que “no se pueden crear regímenes jurisdiccionales especiales como las concesiones de las compañías bananeras y mineras del pasado”. El diputado señaló que hay al menos 25 inconsistencias constitucionales en la Ley de las Zonas Especiales de Desarrollo. El pasado diciembre, cuatro magistrados de la Sala Constitucional de la Corte Suprema de Justicia fueron destituidos por el Congreso debido a su posición sobre ésta y otras leyes, como la de depuración policial, en un movimiento que analistas y expertos legales calificaron de atentado con la separación de poderes y la independencia del Poder Judicial que ha sido elevado a la Comisión Interamericana de Derechos Humanos. El presidente del Congreso, Juan Orlando Hernández, y el presidente de la República, Porfirio Lobo, han declarado en múltiples ocasiones que los magistrados atentaban contra el interés nacional por sus decisiones contrarias al gobierno, entre las que se encontraba la inconstitucionalidad de este proyecto de las “ciudades modelo”. El abogado Óscar Cruz, ex fiscal de defensa de la Constitución y responsable del recurso que consiguió la inconstitucionalidad de la ley anterior, opinó que el proyecto actual “no es lo mismo, es peor. Ha cambiado su formulación nominal, pero el proyecto es el mismo, es la misma violación constitucional que viola la organización territorial del Estado, la forma de gobierno, el marco jurisdiccional del país y los derechos fundamentales de los habitantes. No se decretan límites de aplicación de las zonas, ni territorial ni jurídico, choca con artículos constitucionales fundamentales, como por ejemplo, el que prohíbe que costas y territorios fronterizos estén en manos de extranjeros”. “Lo que se está tocando en esa ley son los intereses vitales de Honduras, habla de que se desarrollará en zonas no habitadas, pero refiere la zona del Golfo de Fonseca, de Trujillo, los puertos más importantes de Honduras, donde se maneja el 70% del comercio internacional de Honduras”, explicó José Antonio Gutiérrez Navas, ex magistrado de la Sala Constitucional de la Corte Suprema de Justicia y quien firmó en octubre la inconstitucionalidad del proyecto. “La Comisión de transparencia de las ciudades modelos podía destituir al gobernador electo, se establecía la posibilidad de que se estableciesen jueces extranjeros en el territorio de Honduras y se despojaba al presidente de la República de sus atribuciones de dirección de política en detrimento del gobernador de un territorio que se está cercenando del territorio. Es totalmente inconstitucional”. Hace un mes, parte del clero de la Diócesis de Santa Rosa de Copán, envió una carta a su obispo Darwin Rudy Andino Ramírez, para que les explique los motivos que lo llevó a anunciar cambios de unos 25 sacerdotes de la zona, sin previo consenso. La diócesis del occidente de Honduras, con al menos 50 sacerdotes, se ha distinguido de las demás, por hacer una opción preferencial por los pobres, como lo han reiterado en diferentes ocasiones varios de sus miembros, quienes además en algún momento han sido y son víctimas de ataques y amenazas de parte de grupos de poder a quien denuncian, desde su labor pastoral y cuentan con el apoyo de la comunidad a quienes defienden. Las destituciones, que fueron anunciadas antes de navidad, mediante una carta dirigida a los sacerdotes afectados, se han realizado sin el debido proceso ya que no fue una decisión consensuada, afirman los clérigos. “Sin embargo, hemos recibido con no poca sorpresa, el pasado 17 de diciembre, una notificación escrita, emanada de Usted, (Monseñor Darwin Andino) con el nombramiento de párrocos, para varios clérigos de este presbiterio e igual traslado de los mismos a otras parroquias”, manifiestan en su carta los sacerdotes. El código de Derecho Canónico de la Iglesia Católica, dice que, cuando el bien de las almas o la necesidad o la utilidad de la Iglesia requieren que un párroco sea trasladado de la parroquia, el Obispo le propondrá por escrito el traslado, aconsejándole que acceda por amor a Dios y a las almas, lo que los sacerdotes piden les explique los motivos de los cambios y no dejar a la imaginación de la feligresía dichas acciones, y todo eso debería tomarse en cuenta. Siguiendo el procedimiento del Canon 1749, es que ellos redactaron una carta en común, el pasado 30 de diciembre. Aseguran que su aptitud fue continuar con algunos traslados, entre ellos hay sacerdotes que mantienen su oposición a las transnacionales, mineras, discriminación racial y opositores al régimen implementado después del golpe de Estado del 2009. Subrayan, que sienten que es de obligada necesidad, una comunión fraterna, puesto que todos trabajan en la misma obra, y plasman que en varias reuniones, el Obispo ha reiterado “las parroquias son mías”, y eso los lleva a pensar que sus colaboradores (párrocos) pasan a ser simples operarios, y eso deforma el sentido de un gobierno jerárquico y se acerca a la forma de un gobierno carente de caridad, autoritario y absoluto, y no desean que eso suceda en esa Iglesia Diocesana. La Diócesis de Santa Rosa de Copán, cuenta con un Plan Diocesano de Pastoral, desde hace treinta años, y fue a partir del 2010, se empezó a trabajar en el III PLAN DIOCESANO de Pastoral de Conjunto, cuya redacción se finalizó en Octubre del año 2011, siendo obispo aun, Luis Alfonso Santos. Con respecto a este tema, Andino dijo, en medios de comunicación, que no está en contra del III plan Diocesano de Pastoral, el cual se culminó antes de que tomara la batuta como obispo, pero que debe ser revisado. Desde 1987 a 1993 desarrollaron el I PLAN DIOCESANO, con los objetivos específicos de formación, organización, comunidades eclesiales de base y pastoral familiar y en el año 2000, ellos pusieron en marcha el II PLAN DIOCESANO de pastoral. La experiencia pastoral que hemos tenido en los últimos 30 años, nos ratifica, lo que con razón nuestros Obispos en Aparecida, declaran: “que todo proceso evangelizador implica la promoción humana y la auténtica liberación, sin la cual no es posible un orden justo en la sociedad” aseguran los sacerdotes. Es claro que una propuesta, es diferente a una ordenanza. La primera, se da en un ambiente de colegialidad y fraternidad. Mientras que la segunda, evoca el mandato de alguien, para un súbdito no deliberante, manifiestan al Obispo de la Diócesis de Santa Rosa de Copán, Darwin Andino. También manifiestan la inexistencia de un consejo presbiteral, es decir, un grupo de sacerdotes que sean como el senado del Obispo, en representación del presbiterio, en donde, la mitad aproximada de ellos DEBEN SER ELEGIDOS LIBREMENTE POR LOS MISMOS SACERDOTES- (canon 497 inciso 1). “Pero en el caso actual percibimos, una acción de gobierno personalista, y sabemos que la individualidad no siempre garantiza una decisión acertada, que afectan no solo a los presbíteros, sino a toda la Diócesis”. También se lamenta que el obispo ha manifestado, la advertencia verbal, que da apertura para la emigración de los insatisfechos “el que quiera irse, que se vaya”. Estamos plenamente convencidos, por las experiencias vividas, que los desaciertos, los errores, las equivocaciones y logros afectan o favorecen al conjunto de la Iglesia diocesana y parroquial, como comunidad de fieles, en donde los párrocos somos constituidos como guías y pastores. Por lo que filialmente solicitamos que el caso actual sea motivo de una objetiva revisión y análisis y se encuentre un correctivo pastoralmente aceptable. Leer carta. La Ceiba- El vicealcalde de la ciudad de La Ceiba, Atlántida, Ángel Salinas sufrió este martes un atentado cuando se dirigía hacia la corporación municipal de dicha ciudad. Según se informó Salinas fue trasladado a un centro asistencial de la zona gravemente herido, sin embargo murió en la sala de emergencias del sanatorio. Las autoridades policiales realizan las investigaciones del hecho criminal. El 19 de enero, en un confuso tiroteo ocurrido en un campo de fútbol de Esquías, Comayagua, zona central de Honduras, perdieron la vida violentamente el alcalde de ese municipio, Wenrris Edelis Hernández, su padre y otros dos hombres más, mientras que un hermano del edil resultó gravemente herido, informaron fuentes oficiales. El pasado 4 de diciembre, autoridades policiales reportaron la muerte violenta del alcalde del municipio de Dolores, departamento de Ocotepeque, occidente de Honduras, Manuel Guzmán. Mientras, que el pasado 18 de junio, también fue asesinado el alcalde de La Labor, Ocotepeque, en el occidente de Honduras, Víctor Hugo Ramírez, en el municipio de San Fernando. Según el Observatorio de la Violencia de la UNAH, en 2011 las muertes diarias fueron 19.47, mientras en 2012 fue de 19.65. Asimismo, en 2012 murieron violentamente unas 7 mil 172 personas en Honduras superando los 7 mil 014 de 2011. En año anterior -asegura el Observatorio- se produjeron 85.5 homicidios por cada 100 mil habitantes. Durante los tres años de la gestión del presidente Lobo se han registrado 20 mil 573 muertes violentas. TEGUCIGALPA, Honduras (AP) — La empresa que mantiene las cámaras de seguridad en las calles de uno de los países más peligrosos del mundo las apagó desde hace semanas porque el gobierno no les ha cancelado los millones de dólares que le debe. La compañía ahora amenaza con suspender la frecuencia de los radios portátiles que usan los policías para comunicarse. El ejército no recibe su salario de manera regular desde septiembre y sólo el viernes pasado les pagaron parte del sueldo de diciembre. Los maestros protestan casi a diario porque desde hace seis meses el gobierno no ha podido pagarles mientras que los médicos se quejan porque desde octubre no hay suficiente insulina para los diabéticos, anticoagulantes para evitar los infartos o insumos básicos gasas, y guantes. Las protestas hay que hacerlas con cuidado porque las calles se encuentran salpicadas de alcantarillas abiertas. Las tapas fueron hurtadas por ladrones nocturnos en completa impunidad. Honduras, un país al borde de la quiebra desde hace meses, enfrenta una crisis fiscal y financiera mientras que los diputados del país se han demorado en aprobar el presupuesto general. El país también tiene una enorme deuda externa, 5.000 millones dólares, adquirida en los últimos cinco años que equivale al presupuesto general de la Nación. A ello se suma una deuda interna de 2.900 millones de dólares. En 2007, otra deuda de 3.500 millones de dólares fue condonada por la banca multilateral. La crisis financiera se suma a la sensación general de que Honduras es un estado fallido con una de las tasas de homicidios más alta del mundo, tomado por el narcotráfico que ha invadido sus ciudades y costas y sin justicia constitucional desde hace mes y medio. La parálisis del gobierno se extiende a funciones tan esenciales como identificar a sus ciudadanos. Las oficinas de registro llevan diez días cerradas porque no han pagado los salarios a los funcionarios ni tienen tinta para estampar las huellas dactilares. La Secretaría de Educación dice que el 96% de las escuelas cerraron varios días al año porque los maestros estaban en huelga. “Solo tenemos 180 medicamentos en stock (de los 350 que recomienda la Organización Mundial de la Salud tener)”, dijo a la AP Maritza Ramírez, jefe del almacén de medicamentos de la Secretaría de Salud. “A todos los proveedores le estamos debiendo la licitación anterior. Corremos el riesgo de quedarnos sin nada”. En muchas ocasiones, ante la falta de medicinas e insumos en los hospitales, médicos, enfermeras y personal piden a familiares de los pacientes que consigan la droga o entre ellos hacen colectas para comprar lo que necesiten. “Definitivamente hay pacientes que no se curan de sus enfermedades por este problema”, dijo a The Associated Press la pediatra Lilian Discua, que trabaja en el hospital Escuela de Tegucigalpa. “Por ejemplo, un epiléptico que no toma su medicamento va a caer en crisis. Sucede”. Expertos consultados dicen que la crisis ha sido alimentada por una mezcla de corrupción estatal, el hecho de que 2013 es un año electoral y una economía que ya estaba en dificultades. “En muchos sentidos, el estado ha dejado de funcionar”, dijo Robert Naiman, director de política del Just Foreign Policy, una organización con sede en Washington que busca reformar la política exterior estadounidense. “Si siguen sin pagar a sus soldados, los soldados probablemente van a dejar de ser soldados, y tal vez pueden tomar otra acción”. El capítulo hondureño de Transparencia Internacional reveló en diciembre que durante 2010 y 2011 los legisladores habían gastado diez millones de dólares del erario público en gastos pero que sólo justificaron, recibos en mano, el 14% de ellos. “En el Congreso nacional no existe ningún tipo de transparencia para el gasto”, dijo Ludín Ayala, responsable de la investigación. “Además de ser el más caro de toda Centroamérica. Costa Rica, con el doble del presupuesto estatal, le dedica menos de la mitad a sufragar los gastos de su Congreso”. El ex candidato presidencial y el ex legislador Olban Balladares acusa al gobierno de usar buena parte del dinero público en campañas políticas de cara a las elecciones de noviembre que elegirán al presidente, alcaldes y 128 diputados. “Lamentablemente tenemos una gran cantidad de candidatos que son funcionarios del estado y su tendencia es hacer abuso de los recursos del estado que manejan para sufragar sus campañas”, dijo. En septiembre la AP reportó como un diputado, a través de una asociación y amparado bajo una figura legal, ha gastado unos 127.000 dólares en regalar ataúdes a los pobres. Hugo Noé Pino, economista del Instituto Centroamericano de Estudios Fiscales para Honduras, ve un futuro complicado. “En este año político se pueden estar utilizando los recursos del estado para campañas políticas” mientras se siguen emitiendo bonos de deuda pública, dijo Pino a la AP. “Si no se ha discutido el presupuesto, ¿por qué se ha aprobado el financiamiento (a través de los bonos) para un presupuesto que aún no existe?”. El presidente Porfirio Lobo y el Presidente del Congreso, Juan Orlando Hernández, no contestaron a solicitudes de entrevista por parte de la AP. En sus apariciones públicas, ni Lobo ni Hernández se han referido a las acusaciones de corrupción, pero Hernández culpa al expresidente Manuel Zelaya (2006-2009) y sus partidarios de la situación fiscal: “nos tienen hoy con una enorme deuda… dejándonos un país inseguro, endeudado y aislado del mundo”. Para sorpresa de muchos, la crisis económica –y no la inseguridad– es la principal preocupación de la gran mayoría de los hondureños, de acuerdo con una encuesta que entrevistó a 1,540 hondureños hecha por la Universidad Centroamericana José Simeón Cañas. “El poder público está trastornado de una manera descarada”, dijo a la AP Óscar Cruz, ex fiscal encargado de la defensa de la Constitución. “Se está desmontando el estado. Honduras es sólo una figura jurídica”. Los ingresos al fisco también se disminuyen, según el propio director de impuestos Mario López Steiner, porque “la cultura de evasión fiscal es increíble en Honduras. El promedio general es 43% y en el caso del impuesto sobre ventas, mucho peor aún, del 60%”. La crisis fiscal se extendió a lo político. La sala constitucional de la Corte Suprema no sesiona desde hace mes y medio y sólo hasta el miércoles se nombraron a unos jueces de menor rango que van a fallar algunos casos que no se han resuelto. Entre los casos en mora a resolver se encuentra una apelación para que los magistrados destituidos sean restituidos y un recurso relacionado a un caso de lavado de activos en el que resultó acusado el ex Ministro de Finanzas y su esposa luego de que la mujer fuera detenida por la policía cuando viajaba a San Pedro Sula con 50.000 dólares en efectivo que llevaba en una bolsa de plástico negra. El gobierno y el bloque oficialista del Congreso tienen una idea sobre cómo resolver la crisis fiscal: un proyecto de ley que amplía la cantidad de personas que deben ahora pagar el IVA y la eliminación de exenciones fiscales para las empresas que importan insumos. Las compañías provienen de 70 sectores de la economía, entre ellos se encuentran las franquicias de comida rápida, las líneas aéreas, empresas de generación de energía, agroindustria y empresas que venden repuestos para maquinaria y vehículos pesados. Los partidarios de la iniciativa de ley dicen que va a generar ingresos adicionales por 1.200 millones de dólares, lo que aumentaría el recaudo impositivo nacional en 50% durante un año fiscal. Por ahora, los legisladores suspendieron las exenciones fiscales mientras una comisión legislativa revisa el tema. En conversación con la AP, el director de impuestos dijo que las exenciones “se aprueban en pago de favores políticos por el financiamiento de las campañas electorales, siempre vinculado a favores tributarios”. Muchas familias han sobrevivido gracias a las remesas enviadas por el millón de hondureños que aproximadamente vive en Estados Unidos. El dinero que envían representa el 19% del Producto Interno Bruto del país, según el Banco Mundial. Pero esa plata no es suficiente para que Honduras salga del déficit fiscal. Y maestros como Daniel Espunda lo saben muy bien: “ahora me deben cinco meses de salario, enero será el sexto porque por ahora no he cobrado, nadie le dice nada a uno cuando llega el día de pago, solamente no llega el salario al banco, uno se acerca a recursos humanos de la secretaria de educación, miran el sistema y le dicen que la planilla de pago está pasado a la secretaria de finanzas, llega uno allí y le dicen que no hay dinero. (Ottawa) On Wednesday, January 23, 2013, the Honduran Congress quickly passed and ratified a new mining law that had been developed with support from the Canadian International Development Agency against the will of important sectors of Honduran society. The only step that remains is for the law to be published in the official Gazette, which could take place as early as next week. Once published, it will enter into effect and a moratorium on new mining concessions that been in place since 2006 will end. It is anticipated that this will be followed by an accelerated process to approve some 300 mining concessions, and that another 154 concessions that have already been approved will become active. The law denies access to information about technical and financial aspects of projects and companies involved. This is true disaster capitalism in which the Canadian government has played an entirely self-interested role. In 2009, Honduran civil society had achieved a proposed mining law that had it passed would have incorporated their proposals. But this was shoved aside following the June 2009 military-backed coup of then President Mel Zelaya and never debated. In the wake of this rupture in the democratic life of Honduras, a country that has since become the murder capital of the world with frequent attacks and threats against human rights advocates, journalists and activists, the Canadian Embassy, the Canadian Department of Foreign Affairs and CIDA have all gotten involved in lobbying for and providing assistance toward a law that would be satisfactory to Canadian industry, such as the one that passed yesterday. despite the repressive environment, we can anticipate that communities will continue to organize to defend their lands and waters supplies. Also, the National Coalition of Environmental Networks plans to fight this Canadian-backed law through the Honduran courts and will once again be calling for international solidarity in order to urge the court to proceed fairly and expeditiously with their case. In Canada, it’s vital that this attempt on the well-being of communities – in which our government agencies are complicit – not go unnoticed and that the work to build solidarity with affected communities and their allies continue. The approved mining law, has been elaborated in order to deceive undecided deputies and the public in general. As such, it uses very ambigious language and many euphemisms, for example leaving the door open to open-pit mining by not explicitly mentioning the methods of mineral production that can be used. The law also appears to respect citizen consultation processes, but in the end turns this into a simple procedure to bury the worries and right to effective participation of the population. Overall, the sovereign decision making process of the people is left aside. The clientelistic tone of other laws currently before the congress that would hand over territory and broaden the “rights” of mining companies remains consistent. Companies can sell, transfer, mortage or do what they like with the mineral concession and minerals that are property of the Honduran people. Also, concessions are granted without a time limit, in other words, in perpetuity! For all of this, companies will pay miserable amounts to municipalities and the state. 1. That the Mining Law not be published as long as the demands of the population, environmental and human rights organizations are not incorporated, the same demands that were reiterated during the days of consultation in 2012. 2. That there be a halt to the deception, making people believe that consultation took place when there were already agreements between government authorities and the national and international private sector. 2. Exercise timely pressure so that the Supreme Court of Justice declare this law unconstitutional according to the legal measures that the CNRA will be bringing forward according to the Constitution of the Republic and other laws of the country. Centro Hondureño de Promoción para el Desarrollo Comunitario (CEHPPRODEC), Comité Regional Ambientalista del Valle de Siria, Instituto Hondureño de Derecho Ambiental (IHDAMO), Asociación de Organismos no Gubernamentales (ASONOG), Asociación Madre Tierra, FUNDAMBIENTE, Red Nacional de Comunidades Afectadas por la Minería, FORO AGRÍCOLA Mesa Nacional de Gestión de Riesgo, Movimiento Ambientalista Santa Barbarense (M.A.S. ),Comité para la Defensa de la Flora y Fauna del Golfo de Fonseca( Coddeffagolf) Asociación Nacional para el Fomento de la Agricultura Ecológica (ANAFAE), Fundación Popol Nah Tun, Comités de Defensa de la Naturaleza de los Departamentos de Choluteca y Valle, Alianza Cívica por la Democracia (ACD), Red Ambientalista de los Municipios de Comayagua y La Paz (REDAMUCOP), Movimiento Unificado Campesino del Aguan (MUCA), Consejo de Cuenca del Municipio de Valle de Ángeles, Red de Sociedad Civil del municipio de Langue, Valle, Sociedad Civil del municipio de Aramecina, Valle, Sociedad Civil del Municipio de El Corpus, Choluteca, Sociedad Civil del Municipio de El Triunfo, Choluteca, Movimiento Indígena Lenca del Departamento de la Paz, Fundación SIMIENTE, Movimiento Amplio por la Dignidad y la Justicia (MADJ), Frailes Franciscanos de Honduras, Conferencia de Religiosos y Religiosas de Honduras (CONFEREH). La Coalición Nacional de Redes Ambientales (CNRA) responsabiliza al Congreso Nacional, presidido por Juan Orlando Hernández, de confabularse con grupos económicos nacionales y transnacionales al aprobar una ley de minería que presenta fuertes indicios de inconstitucionalidad e irrespeta la vida humana y los bienes naturales. Tal parece que esta acción refuerza la percepción ciudadana de que “los diputados están incurriendo en un nuevo delito de traición a la patria”. La ley de minería aprobada, presenta un texto hábilmente elaborado para engañar a diputados indecisos y al pueblo en general. Es así como, con lenguaje ambiguo y con muchos eufemismos, se mantiene la minería a Cielo Abierto sin mencionar tal método de explotación minero pero dejándolo implícito. Esta ley aparenta respetar la consulta ciudadana pero al final la convierte en un simple trámite que sepulta las ansias y el derecho de participación efectiva de la población. En suma, se olvida de la toma de decisiones soberana del pueblo. Continúa apareciendo la tónica entreguista de otras leyes en discusión al regalar el territorio y ampliar “derechos” a las compañías mineras. Estas podrán vender, transferir, hipotecar o hacer lo que mejor les convenga con la concesión y los recursos minerales que son propiedad del pueblo hondureño. Adicionalmente se otorgan las concesiones sin límite de tiempo, es decir, a perpetuidad! Para lo cual se comprometen a pagar cantidades irrisorias a las municipalidades y al Estado mismo. 1. No publicar ni poner en vigencia la Ley de Minería mientras no se incorporen las demandas de la población, de sus organizaciones ambientales y de derechos humanos, mismas demandas que se reiteraron en las jornadas de consulta efectuadas en el 2012. 2. No continuar engañando y/o utilizando al pueblo al hacerle creer que se le consulta cuando ya existen acuerdos entre las autoridades de gobierno y el sector privado nacional e internacional. 2. Presionar oportunamente, para que la Corte Suprema de Justicia declare la inconstitucionalidad de esta ley en función de los recursos legales que desde la Coalición Nacional estaremos impulsando amparados en la Constitución de la República y demás leyes del país. Tegucigalpa – El alcalde municipal de Puerto Cortés, Allan Ramos, denunció que alcaldes en diferentes regiones hondureñas están amenazados a muerte. “En algunos sectores del país, varios alcaldes nos han manifestado esta problemática”, reveló. Previendo que la violencia puede incrementarse, el alcalde del principal puerto de Honduras, dijo que espera que “no lleguemos a esos niveles como ha venido ocurriendo en otros países de áreas de Latinoamérica”. Consecuentemente, el edil solicitó al Gobierno que brinde el apoyo logístico en el tema de seguridad a toda la población y a los que desempeñan el cargo de alcaldes. El fin de semana, en un tiroteo ocurrido en un campo de fútbol de Esquías, Comayagua, perdieron la vida violentamente el alcalde de ese municipio, Wenrris Edelis Hernández, su padre y otros dos hombres más. Manuel Guzmán, alcalde del municipio de Dolores Merendon, norte de Ocotepeque, fue asesinado a inicios de diciembre de 2012, cuando se dirigía a su finca en un vehículo, desconocidos lo acribillaron. A mediados de 2011 fue asesinado Víctor Hugo Ramírez, alcalde de La Labor, Ocotepeque. El jefe edilicio fue emboscado y acribillado. El hecho ocurrió en una calle de tierra del municipio de San Fernando, Ocotepeque, en el occidente de Honduras. De acuerdo con los informes, la muerte de Ramírez se produjo en horas de la noche, cuando el edil regresaba hacia La Labor después de coordinar actividades de un evento que realizarían en ese sector. A finales de este 2012 trascendieron las amenazas a muerte y las advertencias en contra de la vida de Francis Rodríguez, alcalde del municipio de Potrerillos, en el norteño Cortés. El alcalde Rodríguez ha emprendido una lucha, desde hace un año, para evitar la deforestación de la montaña California. En declaraciones a medios locales, Rodríguez, dijo que las advertencias le han llegado vía teléfono, insinuándole que si no deja de intervenir tendrá consecuencias. Hace tres años, el alcalde de la norteña región de Jocón, Nelson Javier Portillo, fue ultimado junto a un guardaespaldas, al caer en una emboscada, tendida por desconocidos. En los últimos años varios candidatos a cargos edilicios fueron asesinados antes de las elecciones internas. Igualmente parientes de alcaldes han perdido la vida en forma violenta. La violencia en Honduras cobra la vida de unas 20 personas diarias. A primera vista, podría parecer una típica escena de un parque de juegos en cualquier lugar de Centro América. Las niñas juegan tranquilas y los niños corren detrás de una pelota de futbol desinflada en una cancha improvisada de barro seco. Pero en medio de este cuadro típico en un barrio pobre en la capital hondureña de Tegucigalpa, hay un espectáculo nuevo y chocante. Se trata de soldados, armados con rifles de asalto, que pasean por los terrenos de la escuela. A las aulas de madera de esta escuela se les ha asignado otro rol, como cuartel de una de las nuevas unidades militares, recientemente enviadas a los distritos más violentos del país: un último esfuerzo para detener el impacto diario de la muerte y derramamiento de sangre. Es un signo de los tiempos desesperados en Honduras, el país de América Latina con más homicidios y el más peligroso del mundo entre los que no están en una condición de guerra. La tasa de homicidios alcanzó un máximo mundial poco envidiable de 85 por cada 100.000 habitantes el año pasado, y está en camino para alcanzar los 90 cada 100.000 en 2013. La cuestión de cómo hacer frente a esta epidemia de pandillas y tráfico de droga, que estalló después de que Honduras se convirtiera en una parada clave para el contrabando de cocaína desde América del Sur a Estados Unidos, es la cuestión abrumadora a la cual se enfrentarán los candidatos a las elecciones presidenciales del próximo domingo. Las bandas de narcotraficantes amenazan la viabilidad de Honduras, pero no está claro si alguno de los candidatos realmente tiene una respuesta. Esta semana, el periódico inglés “The Telegraph” fue testigo de la magnitud de los problemas al acompañar a una de las nuevas patrillas militares a través de uno de los barrios más peligrosos de la capital, Tegucigalpa, un revoltijo de barrios en expansión que se extiende a través de un valle en forma de cuenco. “Estas áreas estaban en las manos de las pandillas”, dijo el coronel José López Raudales, un ex comandante del ejército cuyos hombres fueron entrenados a través de un curso acelerado de estrategia policial antes de ser enviados a las calles el mes pasado. El laberinto de viviendas marginales – donde las calles son pistas de tierra y las alcantarillas abiertas pasan a los lados de paredes con grafitis, en los cuales las pandillas amenazan de matar a los informantes – solía ser una zona de prohibición para las fuerzas de seguridad. La policía tenía demasiado miedo, estaba equipada demasiado mal, era ineficiente y con frecuencia cómplice de delitos relacionados con el crimen. El coronel Raudales tiene 100 solados bajo su mando en la escuela, una parte de los 1.000 policías militares involucrados en la represión. Hablando anónimamente por temor a represalias, la directora de la escuela les dio la bienvenida en sus aulas, contando cómo sus alumnos solían tener que refugiarse debajo de sus escritorios cuando estallaban los tiroteos en las calles. Una de las primeras tareas de la unidad militar fue retirar el cadáver de un hombre que recibió 12 disparos en la cabeza. Pero el coronel Raudales dijo que no había habido más muertes allí desde su implementación. “Nuestras operaciones continuarán hasta que esta área sea librada del crimen”, insistió desafiante. Eso, sin embargo, es una formidable misión en un país de 8,5 millones de habitantes, donde 20 personas son asesinadas cada día, cinco veces la tasa de la más violenta grande ciudad de Estados Unidos, Chicago. Intercalada entre Nicaragua al sur y Guatemala al norte, Honduras tiene la dudosa distinción de ser la original “república bananera”, un término acuñado por el escritor estadounidense William Sydney Porter, conocido por su seudónimo de O. Henry, quien huyó allí en la década de 1890 para escaparse de los cargos de malversación de fondos. Pero mientras Porter utilizó la frase para describir un país en deuda con las grandes empresas de frutos sin escrúpulos, hoy es un comercio de otra naturaleza y mucho más implacable el que domina la escena. Alrededor del 80 por ciento de la cocaína que llega a territorio de Estados Unidos ahora pasa a través de Honduras, ya sea por mar o por aire, con pistas de aterrizaje remotas excavadas en la inaccesible selva del noroeste del país. Las violencias que traen el narcotráfico y la lucha entre pandillas son tristemente cotidianas para los hondureños. Sus periódicos ofrecen un resumen diario de asesinatos y caos, ilustrados con fotografías truculentas de cadáveres ensangrentados. La violencia es más abierta y brutal en los barrios en las cimas de las colinas, donde hay pobreza extrema. Pero también se ha extendido hacia abajo en los barrios de clase media de la ciudad, que ahora son una red de enclaves vigilados por agentes de seguridad privados que controlan lo que una vez eran calles regulares de la ciudad. Junto a secuestros, robos, asaltos y asesinatos, también existe la imposición del omnipresente “impuesto de guerra” a las pequeñas empresas, incluso las escuelas: de esta manera las pandillas locales venden la “protección”. Y en un ataque que conmocionó a la élite rica de la ciudad, algunos hombres armados abrieron fuego este mes a la hija del ex presidente del país en un aparente intento de secuestro. Donatella Micheletti, de 21 años, salía de un gimnasio cuando su automóvil fue bloqueado por tres hombres en otro vehículo que dispararon contra el conductor. Sus guardaespaldas devolvieron el fuego y la víctima logró escapar con heridas leves. Su padre Roberto fue nombrado presidente tras un golpe de Estado en 2009, aunque no se cree que el asalto haya tenido fines políticos. “Estas personas son tan descaradas que incluso atacan a la hija de un ex presidente y sus guardias”, dijo un empresario hondureño que maneja por la ciudad con una pistola en su cinto y un asistente armado. “Este país se está convirtiendo en el perfecto apocalipsis zombi. Estamos cayendo en el mundo de los estados fallidos”. Juan Orlando Hernandez is determined to get new legislation approving Regimenes Especiales de Desarrollo (RED), what people have been calling “model cities”, through the session of the Honduran Congress that ends this month. To that end, he has introduced a new package of legislation. He says this draft law takes into account the objections raised by the Supreme Court that made the previous law unconstitutional. Uncommented on is why he did this, since he later got Congress to illegally dismiss the justices that found the law unconstitutional. Might it be that they were right? Oh my! What Juan Orlando Hernandez has done is change the name, change the function, and keep the acronym. This is meant to preserve the mental link to model cities, but this legislation is not about model cities. The proposed entities are nothing like the previous Regiones Especiales de Desarollo proposed under the unconstitutional law. Nor are these any kind of model city using either Paul Romer’s or Michael Strong’s definitions. Forget everything you’ve read. This is something very different. These zones will all supposedly have “functional and juridical autonomy”, although later in El Heraldo‘s brief description of this new system they say that conflicts will be handled either through arbitration or through a new branch of the existing Judicial system. So that’s clear, right? There’s a twist, though given Honduran electoral politics, not much of one: these new entities can only be established by a referendum and once established their charter can only be modified by a referendum of those who live within them. The law will modify the Honduran constitution, which is why it’s urgent to get it passed in the next few days, before this legislative session ends. In Honduras, constitutional amendments must be passed by two successive sessions of Congress. More or less what Juan Orlando Hernandez plans is to bring this up as soon as January 19, then again right after January 25th when the new Congressional session begins. The national territory will be divided into Departments and zones subject to special rules in conformity with Article 329 of this constitution. Their creation and boundaries will be decreed by the national Congress. The Departments will be divided into autonomous municipalities administered by officers elected by the people, as governed by law. Also due to be modified is Article 329. It currently gives the government the power to develop economic plans, in consultation with its citizens and to set up whatever mechanisms are necessary to achieve these goals. El Heraldo does not give us the new language of this constitutional modification, but it will be the key to understanding these new special development regimes. However, later in the day, Tiempo published the proposed language of Article 329 which seems to contain no changes to the existing language. The ability to impose justice comes from the people and it is offered freely for the state, by magistrates and independent judges, only subject to the Constitution and the laws. The Judicial branch is made up of a Supreme Court, special jurisdictions in regions of the national territory subject to special rules created by the Constitution of the Republic, by appeals courts, the courts and other dependencies indicated by law. Again the modification here is to add the reference to special rules zones. The key will be how justice in those special rules zones articulates with the Judicial branch, which notably is not spelled out in this change. Along with Hernandez, the new law is being pushed forward by Congressman Rodolfo Irias Navas, a National party member and owner of TV stations (Channel 8 in Tela, Channel 45 in La Ceiba) and radio stations (Communicaciones del Atlantico, Radio El Patio of La Ceiba, Stereo 92 FM, Stereo 102.5 F, and Romantico 103.5 in La Ceiba, Radio Aguan in Colon, 91.5 and 92.7 FM in Tela). Anyone who can read should see that this is not anything like the previous legislation, and that it’s not about real development. It’s a law designed to benefit the monied class in Honduras that’s responsible for underdevelopment, the class that sees the government of Honduras as its reliable income stream. We’re not the only ones to see it that way. Analyst Raul Pineda pointed out that the reason this law is being rushed through is the urgent need for some in the oligarchy who owned or speculatively purchased lands they expected to be appropriated under the unconstitutional model cities law, to sell those properties for financial reasons. Or as he put it: it’s because a few people need to do business.